The Secretary, TREI Society in her reference dt.03.02.2017 has stated that every year about 45,000 candidates are aspiring for admissions in the available 590 seats in the existing Residential Junior Colleges under the Telangana Residential Educational Institutions Society. 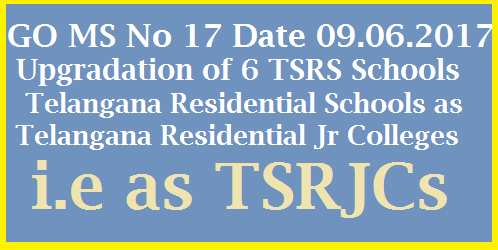 Thus, it is evident that there is a huge demand for admissions for Intermediate in the Residential Junior Colleges under Telangana Residential Educational Institutions Society(TREIS). In all the similar sister Societies viz., Mahathma Jyothiba Pule Telangana Backward Classes Welfare Residential Educational Institutions Society (MJPTBCWREIS), Social Welfare Residential Educational Institutions Society (SWREIS), Tribal Welfare Residential Educational Institutions Society (TWREIS) and Telangana Minorities Residential Educational Institutions Society (TMREIS) and in the Model Schools, Intermediate courses are being offered . The TREIS is the pioneer in Residential pattern of education but is lagging behind in the up-gradation of the schools into Junior Colleges.